Members facing difficult times, aggressive competition, high wholesale prices, and overbearing enforcement will continue to get support from the Federation was the message from the new president of the National Federation of Meat & Food Traders, Michael Beaumont. In his presidential statement to members at the Federation’s recent AGM Beaumont ,who farms in Cambridgeshire and produces cattle for the Fulbourn shop run by his son James, went on to say that the NFMFT welcomed the Government’s recent rejection of the Full Cost Recovery proposals and reaffirmed the Federation’s opposition to the Cross Contamination Guidelines and a promise to continue to work toward a political solution with the Country Landowners and Business Association (CLA) and the Federation of Small Businesses (FSB). 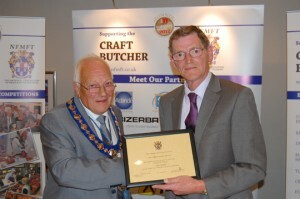 Michael Beaumont (left) takes over as NFMFT president from Philip Edge. 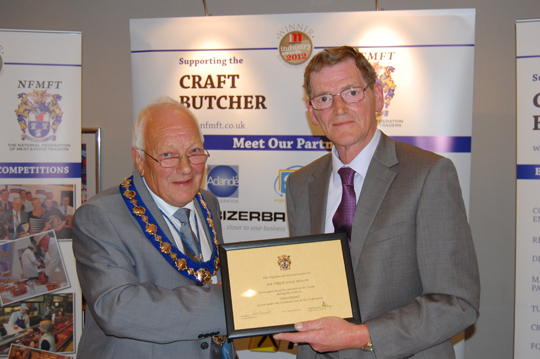 With the commitment to re introducing the Premier Butcher Scheme during his term, Michael said that members would be offered the opportunity to improve their knowledge, aid customer retention and increase sales. He finished his address mentioning newly introduced training courses, an upgrade of the Be A Butcher website and support for a team in this year’s International Young Butcher Competition. In his address to members Mr Soule also said that the Full Cost Recovery and Guideline issues had and were threatening many businesses in the rural economy and emphasised that although the FSB had the lobbying machine and strength of numbers it valued the technical knowledge and expertise which the Federation brought to the partnership. The day finished with lunch and a sightseeing trip around Cambridge but not before the presentation of the Ladies Section Shield to the Colchester and District Butchers Association and presentations and title of Life Honorary Vice President to retiring Executive Members Laurie Marchment (Southern Area) and Bryan Cockburn (Northern Area).